Today: How to keep canned tomatoes and their dangerous juices in their proper place. We've sang the praises of fresh summer tomatoes time and time again. As much as we love tomatoes -- those colorful globes bursting with sweet, seedy juice -- we can't say the same about tomato stains (especially in this season of white pants). With fresh tomatoes, you can (try to) control their juice spillage -- but canned tomatoes always seem to be peskier. 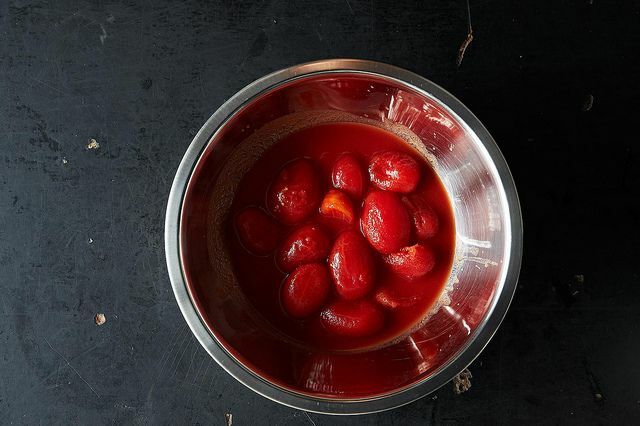 Many of the recipes that call for canned tomatoes require them to be crushed or cut, meaning that red juice inevitably squirts into the air and onto the countertops, the walls, and worst, your clothes. Practical cooks might take preventative measures and wear an apron for this task, but thanks to Cook's Illustrated and their brilliant reader-submitted tips, we've solved the problem by going right to the source. 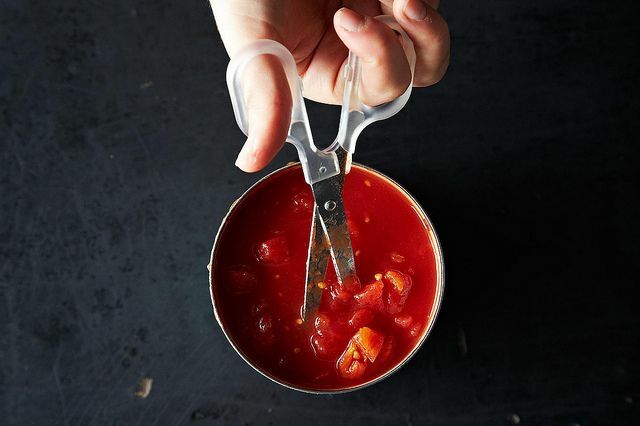 Here's how to crush and chop canned tomatoes with no mess (and no apron). First, open your can of tomatoes. Those shriveled lumps are fire-red and practically waiting to stain you, but stay calm. Stick your scissors in there and have at it. If you want to separate the tomatoes and their juice, simply strain the chopped tomatoes using a metal sieve. Dump the can of tomatoes in a large bowl. Careful: fatal splattering has been documented at this stage. Submerge each tomato under the juice and then use a masher (or your hand) to crush the tomatoes one by one. 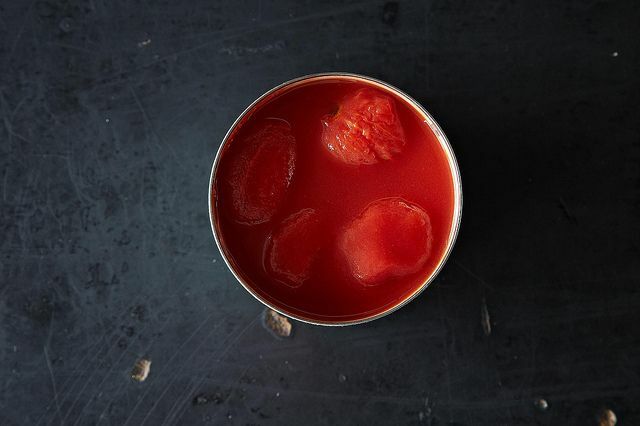 Make sure to keep the tomatoes beneath the surface of the liquid as you crush them: the juice that bursts out of the tomatoes does not have enough force to rupture the surface of the liquid, so all splatters are contained. 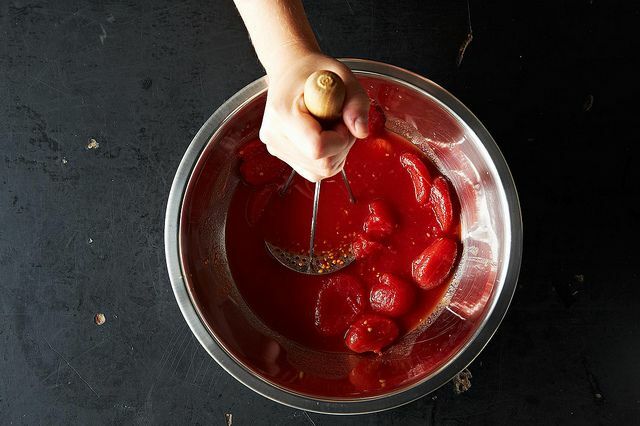 How do you handle messy canned tomatoes? Share your best tips in the comments below! I just dunk my immersion blender right in the can. Is all the splattering contained by the liquid? That is amazing -- and daring!